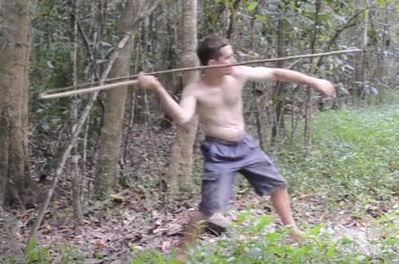 A spear thrower is a simple tool that allows the user to throw a spear further than by hand alone. It is a small length of wood with a hook in the end that fits into a notch in the back of the spear. The extra power and distance gained by the thrower is due to the extra leverage it gives. I cut a small branch with a minor branch coming off the side. I shaped the minor branch into a spur to fit into the end of the spear. The thrower was about 65 cm long. For the spear, I cut a thin sapling approximately 2 m long and about 1.5 cm thick. I carved a cup in the end of the spear for the spur to fit into. Then I bound the back of the spear with bark fiber to prevent the wood from splitting. The head of the spear was simply charred in the fire and scrapped against a rock to sharpen it (during practice the head regularly breaks so only a sharpened tip is used to save work). To use the spear thrower, the spur of the thrower is inserted into the cup of the spear. The spear and thrower are held at about shoulder height. The thrower is quickly flicked forward and the spear propelled towards the target. As the spear leaves the thrower it bends slightly storing energy until it jumps of the spur. During flight, the flexible spear wobbles and oscillates paradoxically giving the spear some stability in flight. The throws in the video show what can be done in one afternoon of practice (my arm got sore and I wanted to start on other projects). I hit the target a few times at a distance 15 m. It is more powerful than a spear thrown by hand alone but is difficult to learn. The spear I made could have been a fraction lighter and so would have greater speed. Another improvement would be to add flights to the spear so it would be more accurate and fly straighter (like an atlatl). The extra energy gained from a Woomera's (Australian spear thrower) use has been calculated as 4 times that of compound bow (Wikipedia). It's easy to make (this took less than a day) but requires lots of training to become accurate.